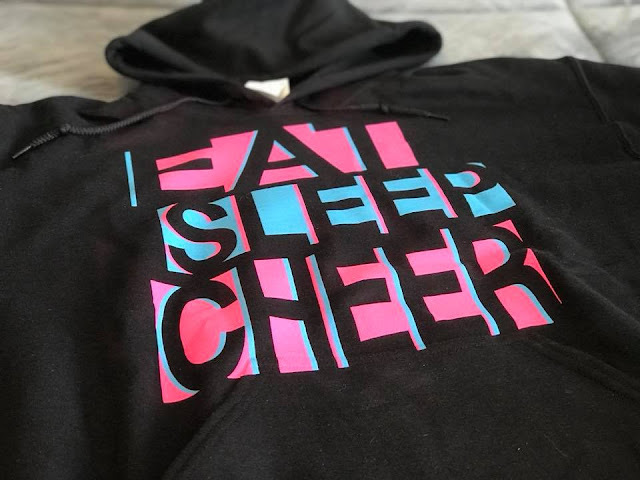 EAT...SLEEP...CHEER - @ExpressionTees - This Hoodie And Our Life Now! It's an expensive...all consuming...time commitment for a girl (and her family)! One that I am super excited about! 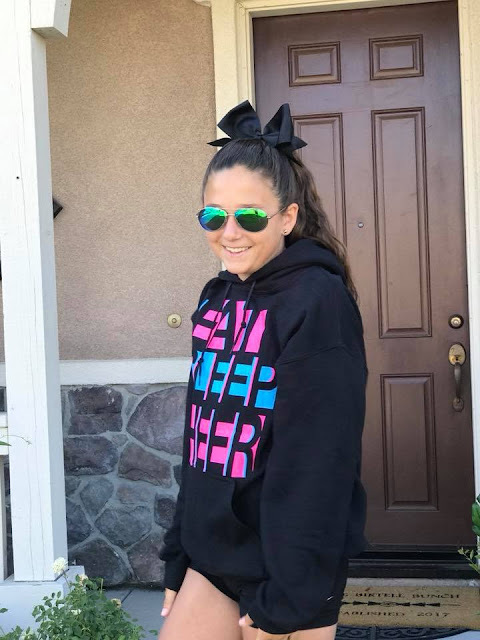 Our oldest daughter made the freshman cheer squad at her high school for this coming school year. 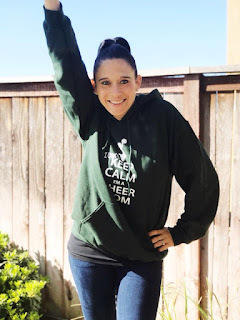 This cheerleading commitment doesn't just start when the school year starts. 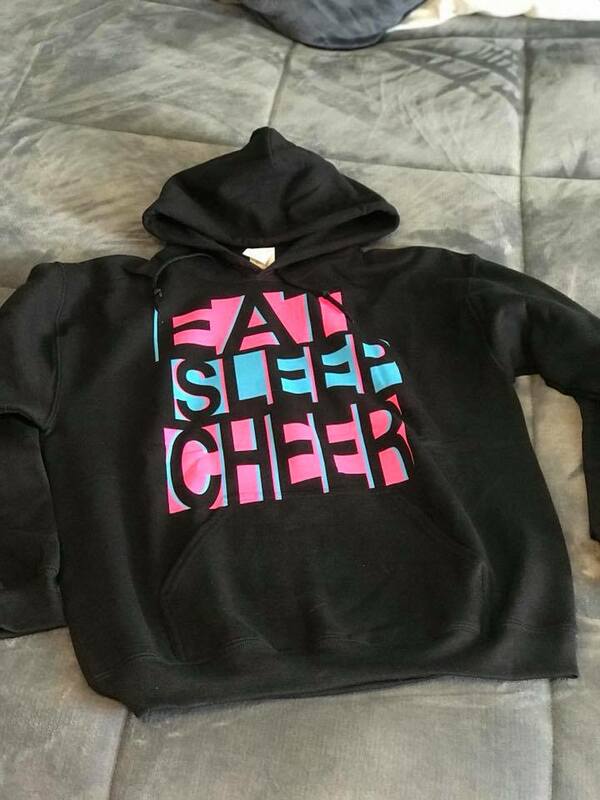 It actually starts next week...when our lives become "EAT...SLEEP...CHEER"! I knew she had to have it. I mean, it has the retro "SAVED BY THE BELL" look to it (which I love)...and is totally IN right now! But it also is super warm and comfy (perfect for the winter months of cheer, which will be here before we know it)! I remember when I was cheering, my parents bought a sweatshirt for me in high school, that I wore for years and years after. SEE PICTURE ABOVE (clearly taken several years after high school)! I even wore it after I became a mom...I loved it so much! It truly was my favorite! It was really thin and worn out when I finally decided to part with it. That was a sad, sad day! 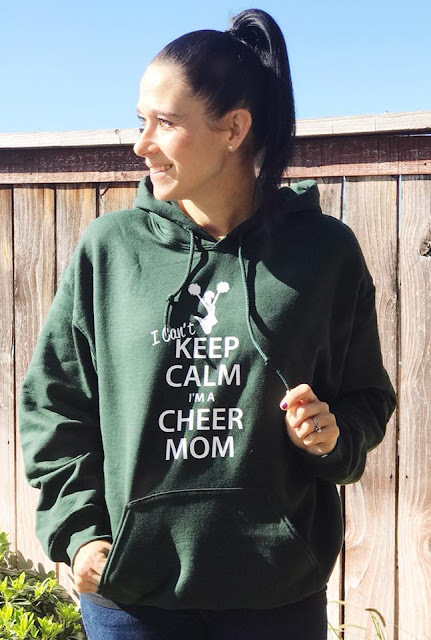 I see this being that type of hoodie sweatshirt for her! She will wear it a lot now, but it will be her "go to" sweatshirt as she grows up too. Especially if she decides to cheer for more than just one year. 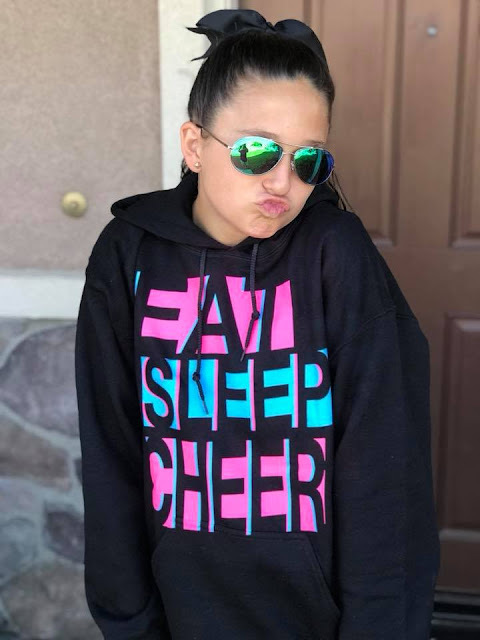 This graphic hoodie sweatshirt is heavy duty, the printing quality is 100% awesome and it's just a super adorable hoodie all together! 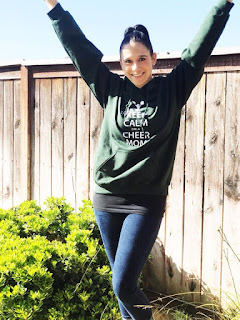 Expression Tees has more than just this cheerleading hoodie. They have graphic tees that will LIBERATE any girl/lady! I love all their stuff! 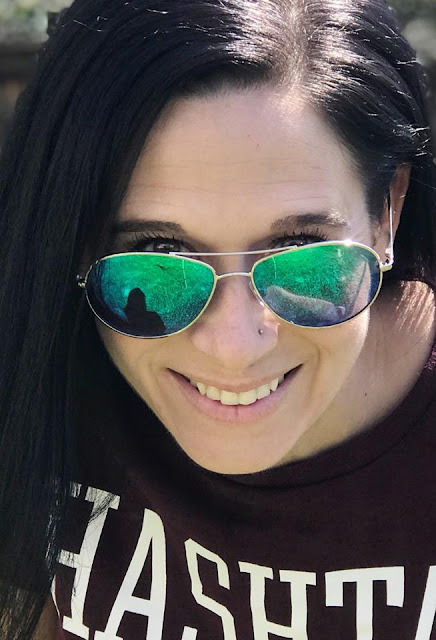 CLICK HERE to check it out and let them know that One Not So Bored Mommy sent ya! I was not paid to post this feature! The only compensation I received was the product that was sent for this review/feature. I TAKE A TRILLION PICTURES! Maybe I'm exaggerating a little, but if you know me, you know I love to snap shots of everything going on...all the time! But there have been times I've had to delete pictures from my phone because I simply didn't have space for them. TRUST ME...I hate being limited on how many pictures I can take (it makes my stomach hurt just thinking about it), because of my phone's ability to store them all. That's where KWILT Shoebox comes in extremely handy. 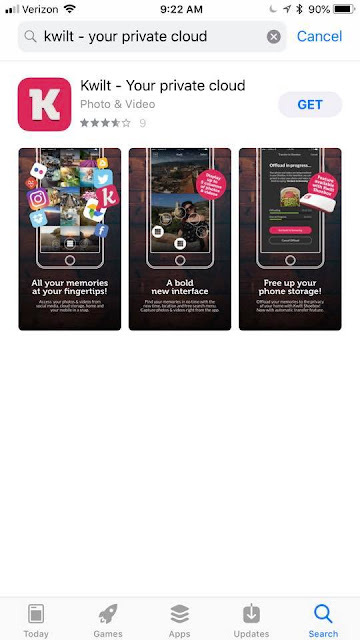 This easy to use, portable device...becomes a storage CLOUD at your home, office or school to store all those pictures. 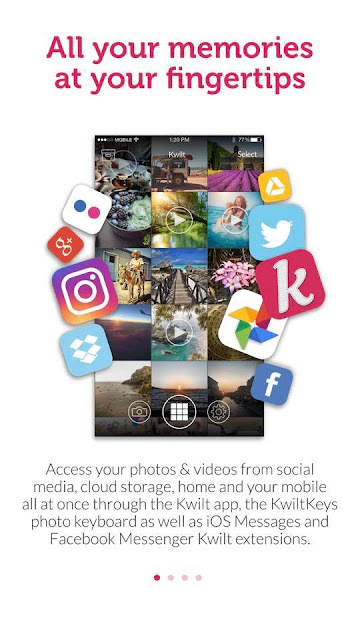 It's a simple, easy way to transfer the photos from my phone (freeing up space), to this portable drive (and app), so I can always use and share my photos, but they are not limiting the amount I can take based off my phone's storage abilities. 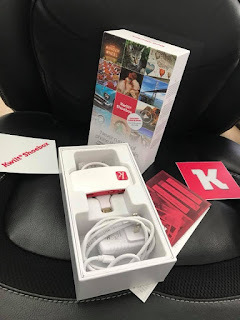 You connect a USB storage stick to the Kwilt Shoebox (it comes with a 32gb one), download the app, set it up, plug in your phone, transfer the photos and WALLAH...space is freed up on your phone, but the photos are SAFELY SAVED on this Kwilt Shoebox! 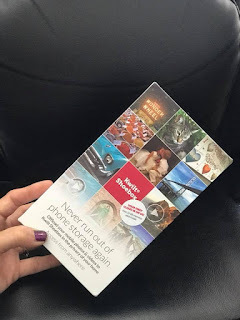 This photo & video storage system is super easy to use and is basically going to become my BEST FRIEND when it comes to picture & video storage, as all my photos now lay safely in it (for me to use whenever I want to) and my phone space has been cleared up so I can take even more awesome shots with no limits. YES!! 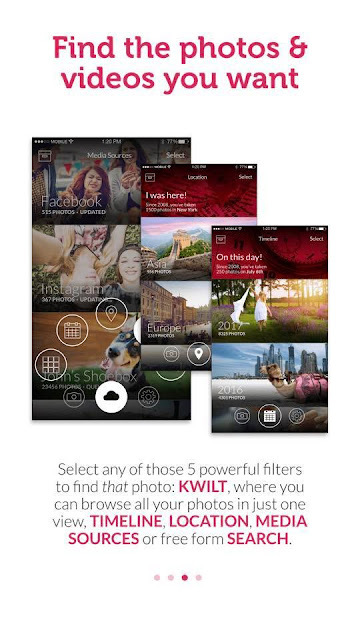 CLICK HERE to learn more about it...download the app...buy the Kwilt Shoebox system for yourself and get to taking those pictures FREELY...and never have to delete one of your favorites because you've run out of space on your phone again! Our oldest daughter made the freshman cheer squad at her high school. THIS IS SOMETHING TO BE EXCITED ABOUT! I'm a proud mom! She worked hard, competed with plenty of other girls and when we found out...we both jumped for joy! 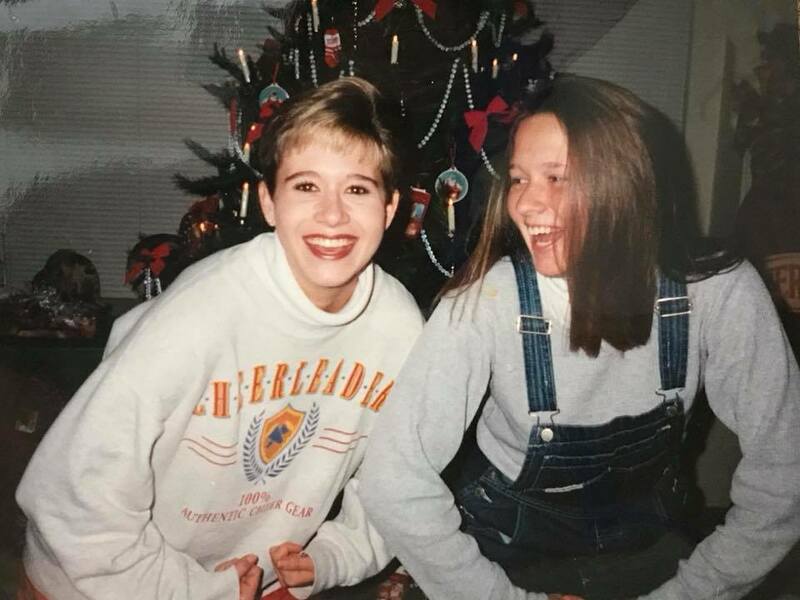 Yes...I cheered in high school (only my junior year), but being a cheery person is kinda my thing! In fact, I am pretty sure it's how most people from high school remember me! So it's fun to watch my daughter get a taste of it and see if it's something she'll pursue throughout her high school career. 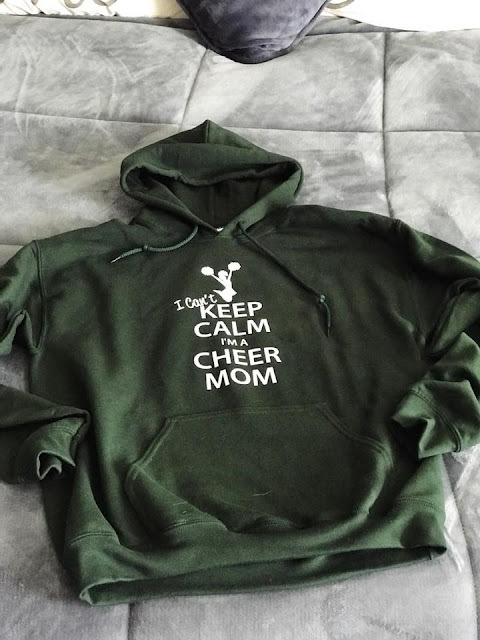 BUT THIS MOM needs some SPIRIT WEAR! HA HA! 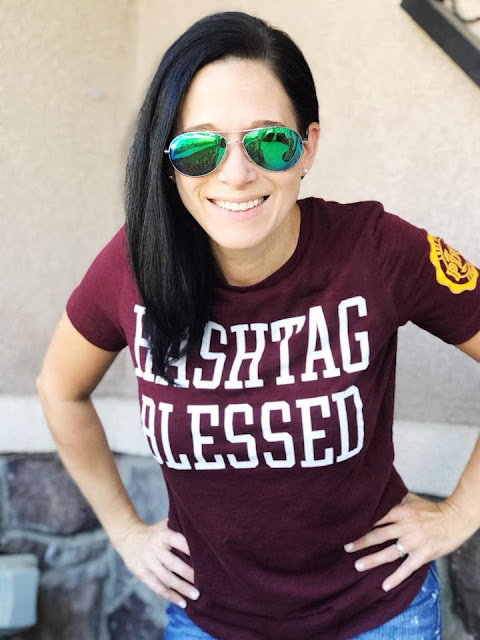 Because...I am that mom! I found Bomb Daddy Tees on Etsy and they had the perfect, I MEAN PERFECT, hoodie sweatshirt for me! We worked together to find the perfect color (to match their school color) and the perfect saying for this coming year...because there will be a lot of excitement and probably a lot of times I'll need to be kept calm. HA HA! 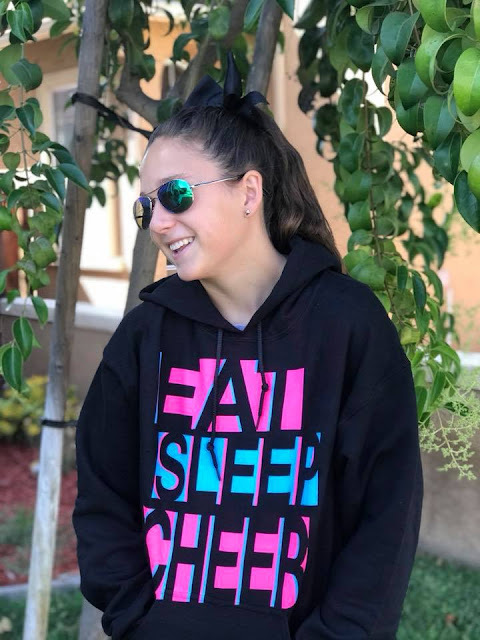 This hand printed hoodie sweatshirt is heavy, cozy and comfy. It's going to be my favorite for sitting in the stands at a football game on a Thursday night. 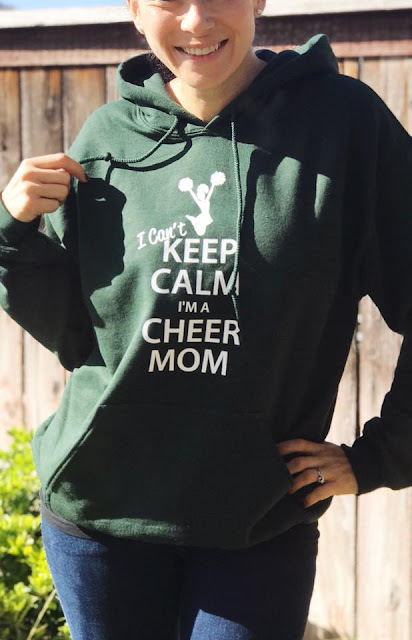 Or even just to wear as a proud cheer mom. 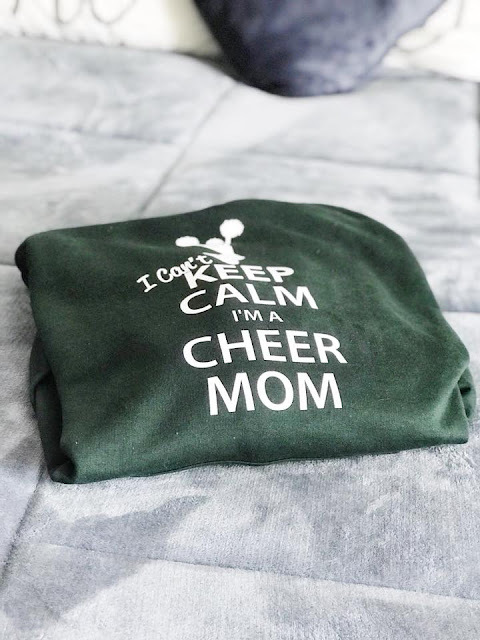 They have TEES FOR EVERYONE...not just "cheer moms"! They do custom stuff too! CLICK HERE to check out their awesome Etsy store and GO SHOPPING! CLICK HERE to follow them on Twitter! That means it's also the longest day of the year and I will probably be spending some, if not all of it, absorbing some Vitamin D in SUNSHINE FORM. 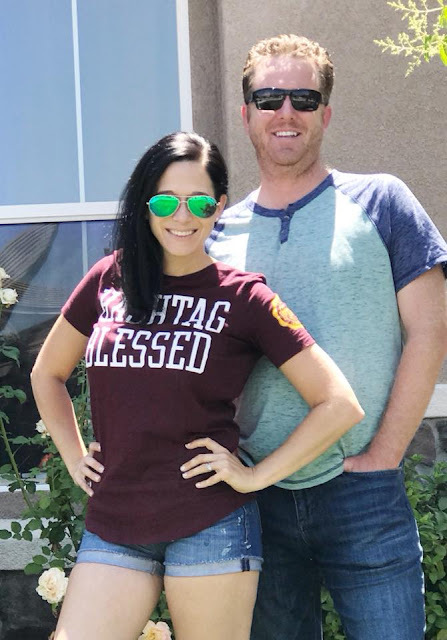 Because both my husband and I have family history of macular degeneration (look it up...it's not good), we have to be careful how much exposure our eyes have to the sun. 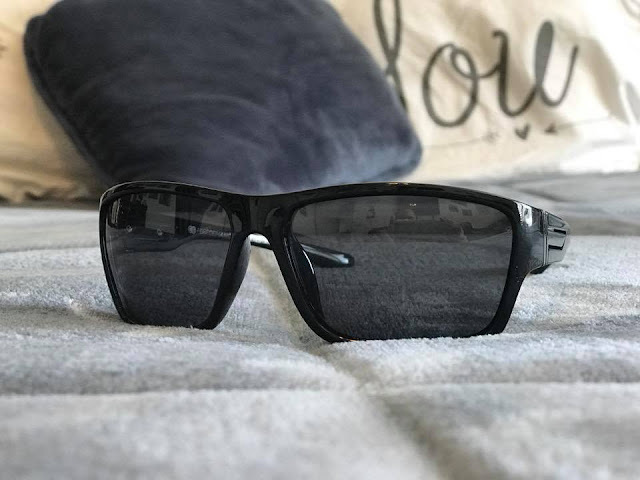 Sunglasses Warehouse has a vast assortment of sunglasses at SUPER REASONABLE prices. Their products are good quality and ship quickly. You really can't go wrong. So when two pairs of sunglasses arrived yesterday, the day before the FIRST DAY OF SUMMER...I was delighted! 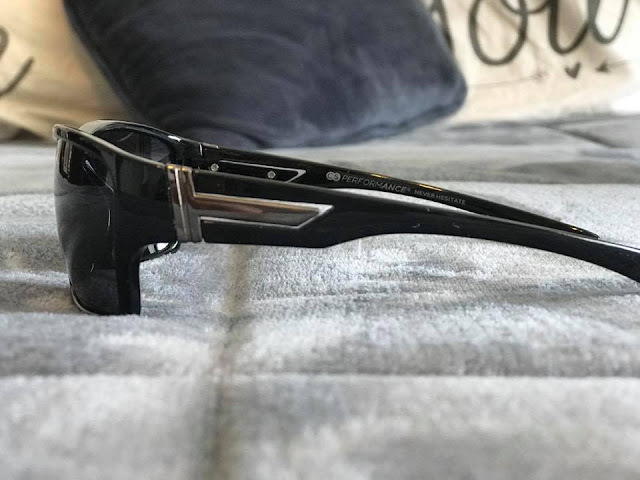 They sent me the Brisbane women's sunglasses. 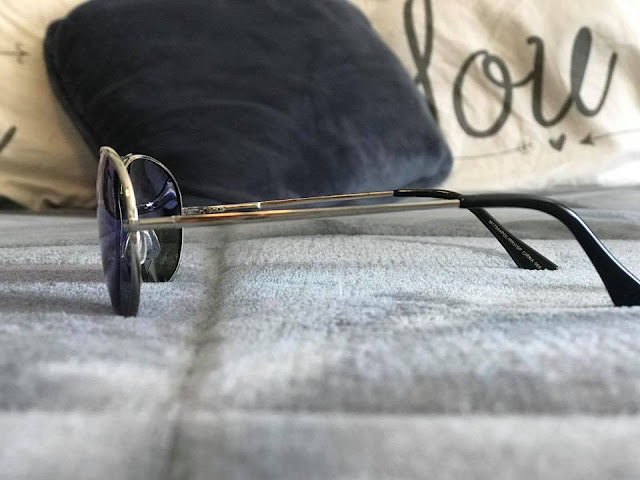 These aviator style glasses are perfect for me, because I have a tiny face and the frames are not too big or too overwhelming. 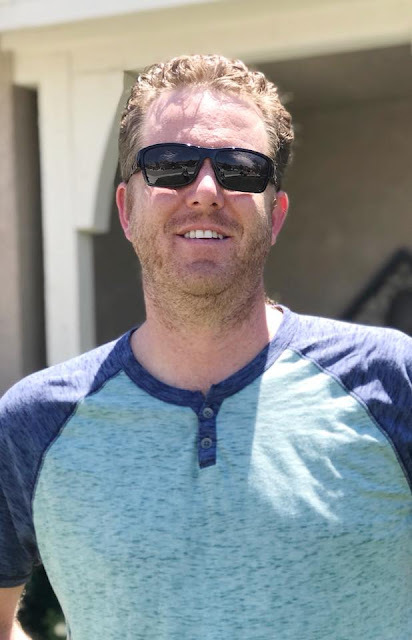 They have polarized and mirror lenses to protect my eyes from any sun damage as well. 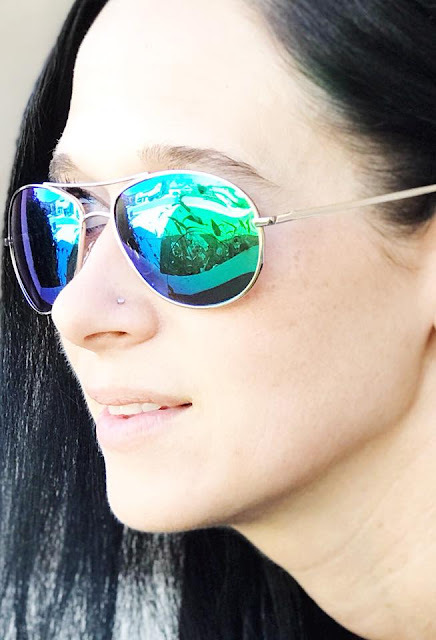 They also have glare reducing lenses that offer UV protection as well. Plus, they are super trendy and cute! 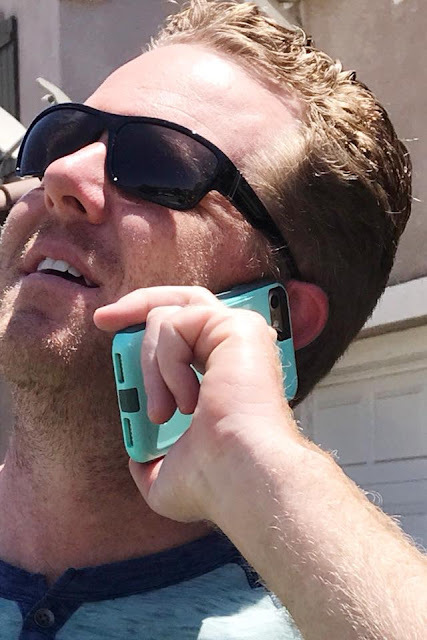 They sent my husband the Bolt men's sunglasses. 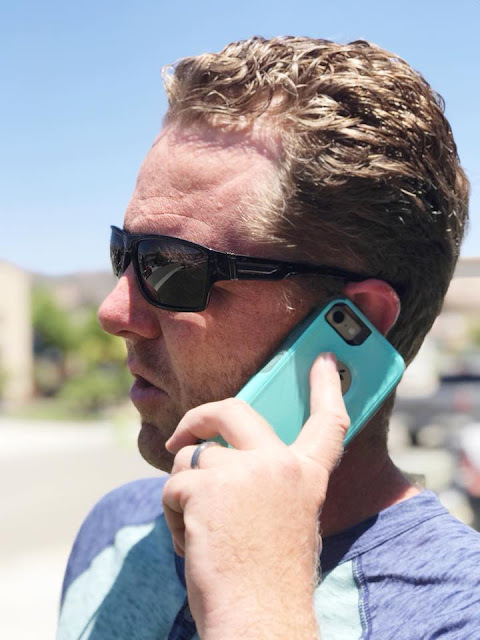 These sport style sunglasses are polarized as well to protect his eyes when he's working in the sunshine (he's a window washer by day) or when we're at a sporting event for the kids or swimming in the pool. 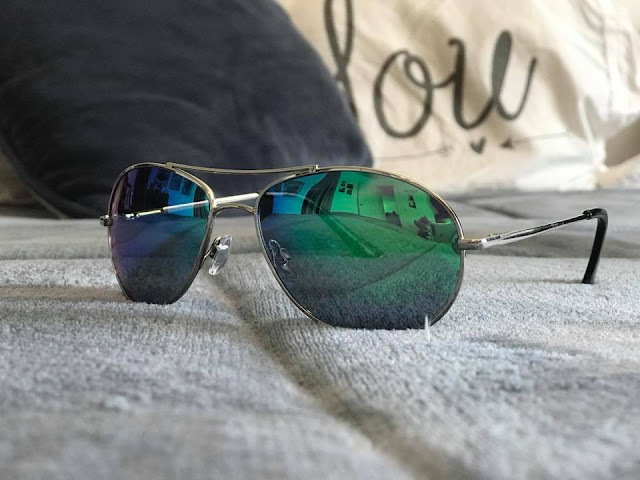 They are flattering, comfortable and will be his GO TO glasses for the summer months ahead. 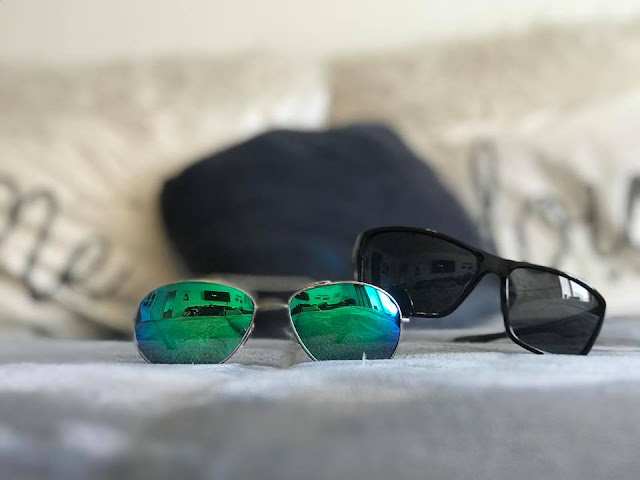 Both pairs of these sunglasses arrived just in time for us to REALLY start enjoying our summer! I can't wait! 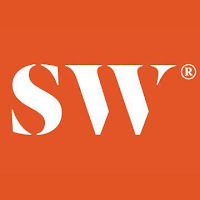 CLICK HERE to learn more about Sunglasses Warehouse and their HUGE selection of sunglasses. Order some today, so you have them for protection this summer too! Use the promo code: SAVE15 to also save 15% off your order. SCORE! All products for this review/feature were sent free of charge by the company. I was not offered any monetary compensation by posting my honest opinion about the products. 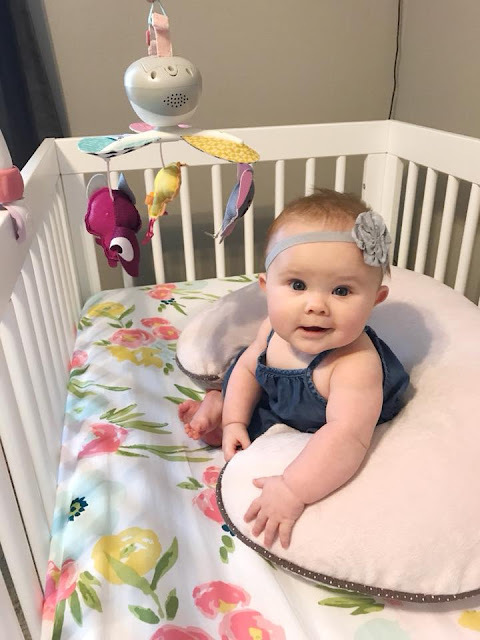 My niece is starting to really grow and change SO MUCH! 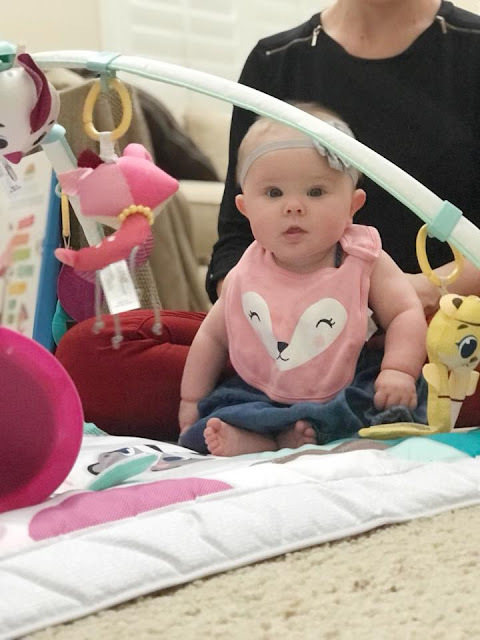 She's learning to use her hands, she's chewing on everything, she can almost sit up by herself and is quite the chatter box. She is also becoming her own little person and is so much fun to watch when she plays. Man...I miss my kids being this little still! 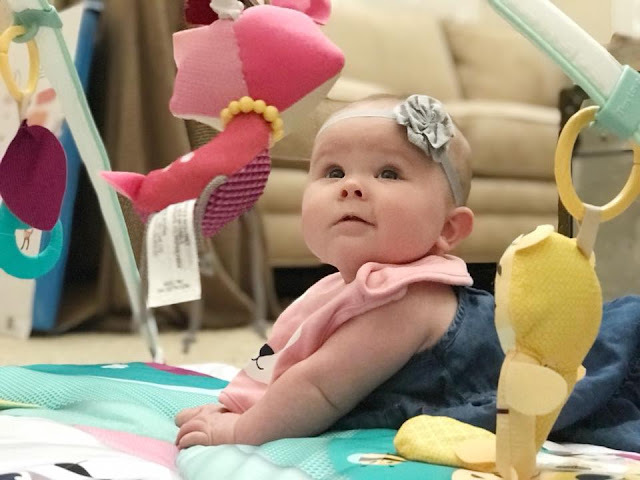 Her parents love products/toys that give her the opportunity to hone in on her coordination skills, give her something fun to chew on (cause teeth are coming soon) and something she can chat with too (she's finding her voice). 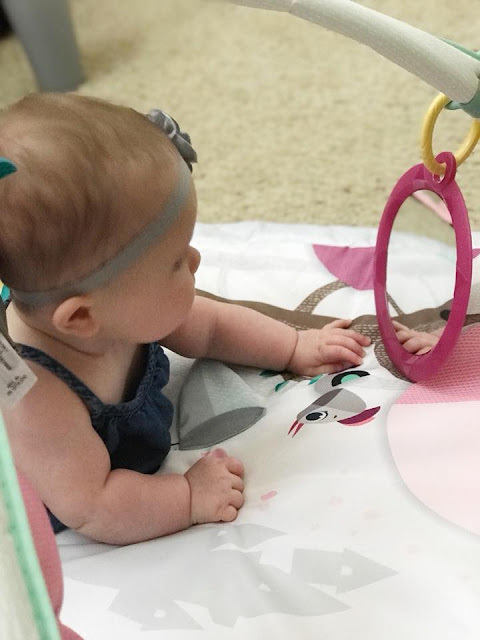 They are huge fans of the floor play mats for her, because she can lay under them on her tummy or back (they are safe) and she can be easily entertained with the colors, the sounds & music and the adorable critters she gets to play with. 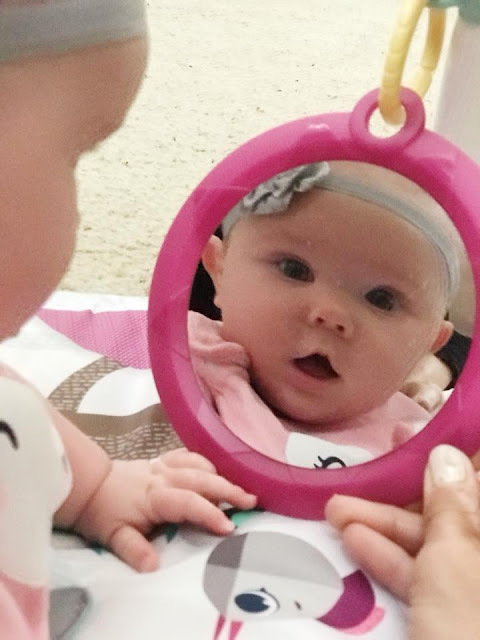 TINY LOVE has sent several products for her to "try out" since she's been born! The one line we hadn't tried yet is their Tiny Princess Tales line. While I believe my niece is going to grow to be a strong, independent woman...it's always fun to also offer a little princess element into her life. I mean, I am her auntie and I love ALL THINGS GIRLIE! 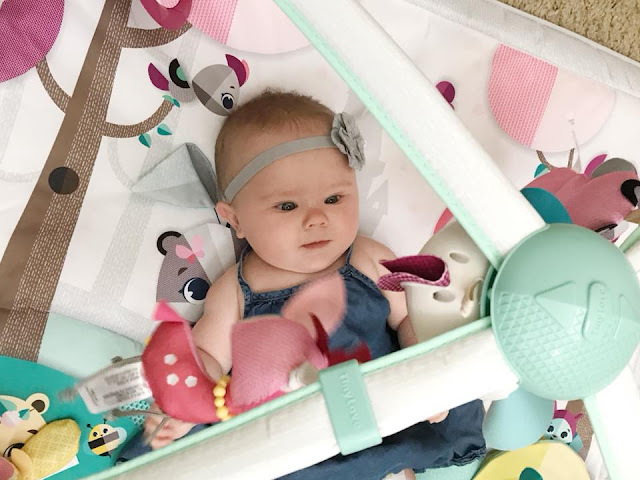 Today, her Auntie (me) got to spend some quality time with her, while she helped me do this review/feature! This Tiny Love Tiny Princess Tales Gymini Mat is the perfect blend of girlie and just down right adorable! 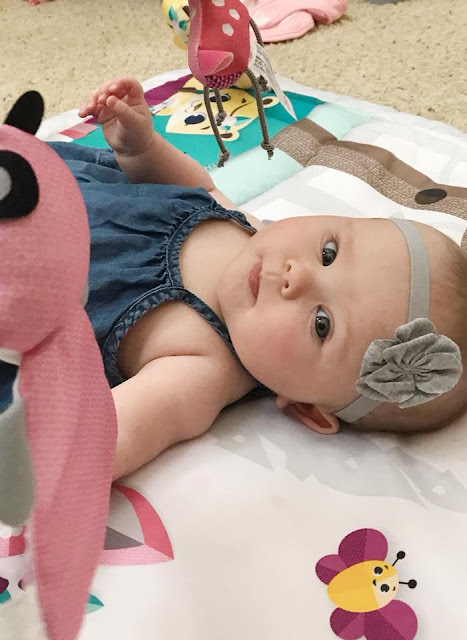 The critters have big friendly eyes, some of them rattle or make sounds when you shake them and the colors are perfect for a little girl to play with. The floor mat itself is nice and cushy, perfect for some floor time for baby. 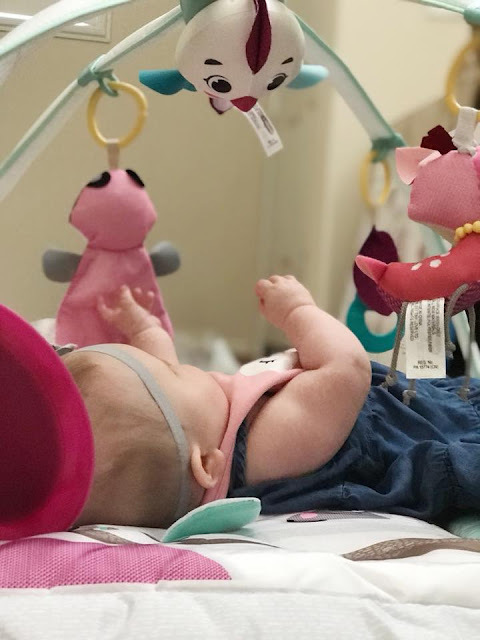 Plus, it plays music and all the critters (Florence the Fawn, Albertina the Beaver, Jane the Squirrel and Nicole the Badger) are detachable, to move them around or hand them to her to chew on (because she is starting to teethe too). LOVE IT! MY NIECE WAS SMITTEN by it! 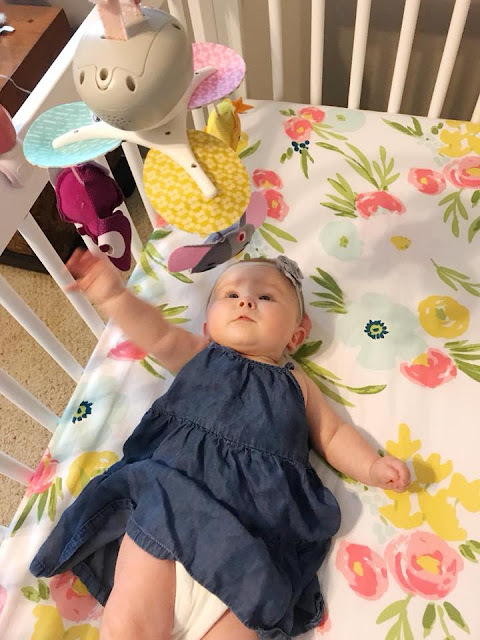 She played and kicked and wiggled and grabbed! She loved the music and even the sounds it makes! 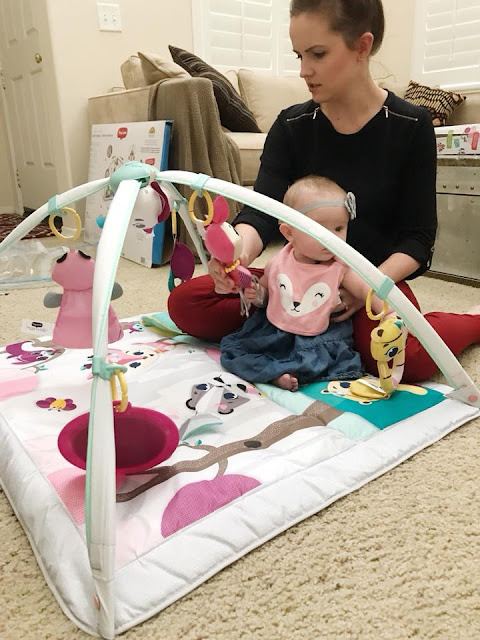 Her mom loved watching her try it out and will be using this probably on a daily basis, to give her some necessary tummy time or even a few moments of not being held. 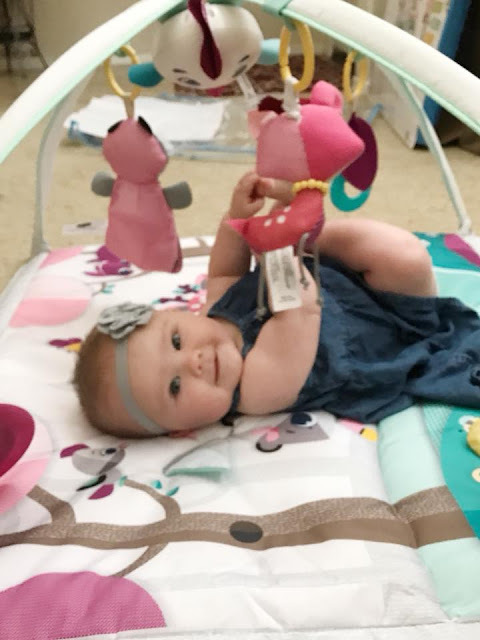 The Tiny Love Tiny Princess Take Along Mobile is also AWESOME too! 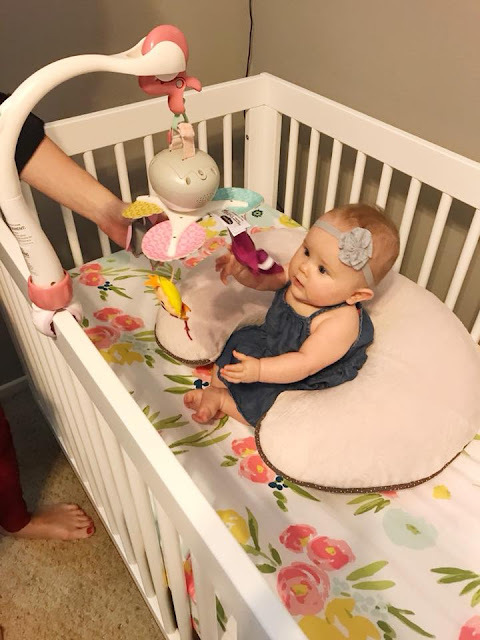 She is familiar with their take along mobiles, but this one has new critters, different colors and fun music too. I also loved that the underside of this mobile is in black/white, while the top part is in color. 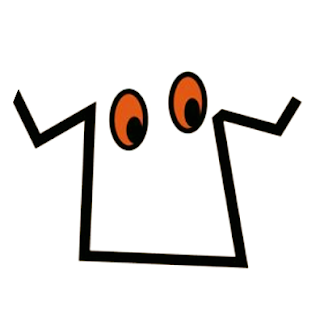 SO CUTE and SO UNIQUE! 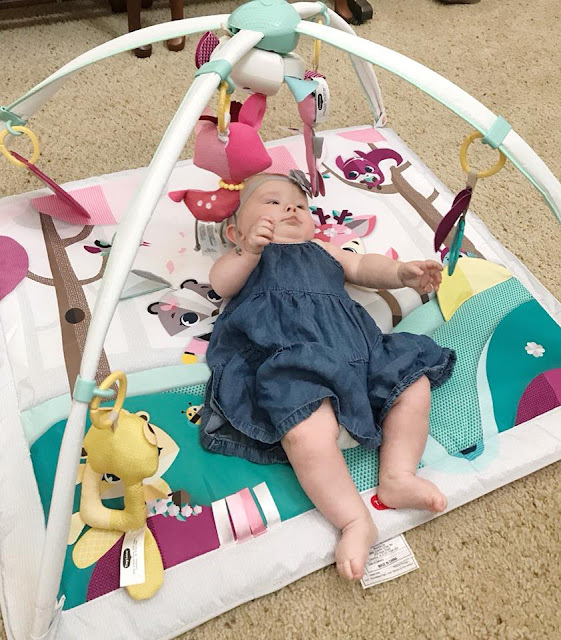 Her mommy loves that it attaches to her crib (for entertainment when she wakes up from a nap) , stroller or even car seat and she can also play with it while learning to sit up (supported by a boppy). And hey, it even matches the bedding in her room! Both of these products are ADORABLE, awesome for her continued learning of her fine motor skills. 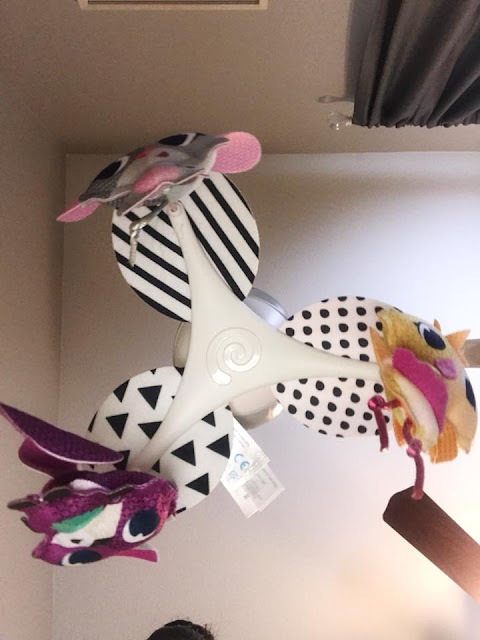 They also provide noises and music that aren't SUPER annoying and very entertaining for baby. It's a WIN ALL THE WAY AROUND! 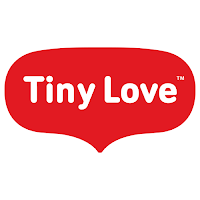 We haven't featured a single thing from Tiny Love that she hasn't loved! These two new things products are no exception. They will continue using not only with my niece, but future babies that might come about too. 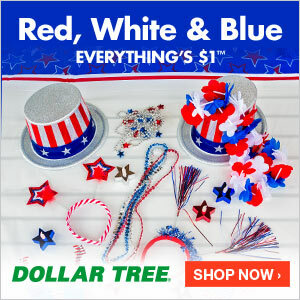 CLICK HERE to check out their entire product line!